I don’t know if you’ve got your tickets already but we have! 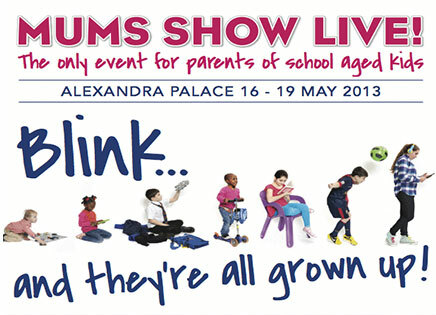 We are thrilled to announce our partnership with Mums Show Live taking place 16th – 19th May at the Alexandra Palace. It’s a brilliant idea for all parents but specifically for parents with kids aged 4 to 12. As mums there is a wealth of information, support, shows and events when the kids are babies and toddlers and then it all stops when the kids go to school. But the need for advice, support, for sharing and nurturing and for all those questions to be answered, doesn’t. You’ll find LittleBirds Tree House in the Palm Court area – you won’t be able to miss us and you won’t want to!! There’s face painting by the expert and fun Follies (http://www.follies.co.uk) who have been face painting for 20 years as well WOW toys (http://www.wowtoys.com) providing tables, play mats and a whole host of toys waiting to be played with. There are Teddy Bear Picnic’s and Circus Work shops the kids can sign up too provided by the amazing Sense Theatre (http://www.sensetheatre.co.uk), soft play on Thursday and Friday from the wonderful Pop Up Party (http://www.pop-up-party.info)with a snowboard simulator provided by SnoZone (https://snozoneuk.com) and Scalectrixs (http://www.scalextric.com) taking over at the weekend – yes, you’ll have to come and visit us more than once! We have different shows happening on different days, with interactive drama shows from Theatre Tots (http://theatretots.com) on Friday, magic show’s on Saturday and National Geographic for Kids Animal Man on Sunday. We have set up a read and relax festival style area with actual size VW Camper tents, deck chairs and sleeping bags courtesy of The Monster Factory (http://www.themonsterfactory.com)! We have a selection of books from LadyBird (http://www.ladybird.co.uk), complimentary National Geographic for Kids (http://kids.nationalgeographic.co.uk/kids) magazines as well as Dandy and Beano albums for the dads, I mean, kids! Did I mention the activity tables? Get crafty with Zebra Ceramics (http://www.zebraceramics.co.uk) and design your own plate or let your children release their inner animal with National Geographic’s fantastic animal mask making craft. Other activities include On a Mission (http://www.onamissionltd.com) ready to challenge your kids courage, taste-buds, code-cracking skills and senses of humour with things to smell and taste, forfeits to perform and cryptic clues to solve. Otherwise you can join in FireCamps robotic workshop and learn how to programme a robot and even help build one. And of course, that all-important café – you can sit down with a cuppa and your kiddies can decorate a cookie – that should at least give you five minutes peace! LittleBird’s Tree House is a place for you to come and enjoy with the kids, full of activities, fun and entertainment! Don’t miss it and don’t miss out. We can’t wait to see you there…..